With more than 112,000 cases of measles reported by 170 countries so far this year, the world is seeing rising rates of a vaccine-preventable illness over last year, according to data released by the World Health Organization today. At this point last year, with just seven fewer countries providing data, a little more than 28,000 cases had been reported. 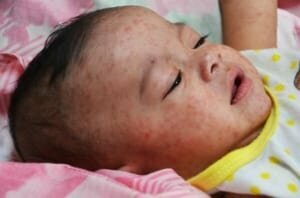 With many measles cases going undiagnosed, untreated and unreported, as well as surveillance and recording challenges in resource-limited countries and lags in reporting times, the numbers released today represent only a fraction of the actual numbers of cases, WHO cautions.